Sacred Reich have announced a UK and European tour which will take place next winter. The thrash veterans will play a total of 28 shows, which are set to begin in Copenhagen on November 8 and wrap up on December 14 in Munich. 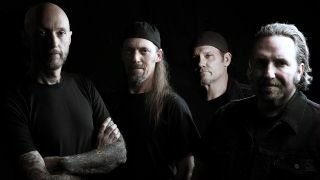 Sacred Reich have organised the shows in support of their upcoming record Awakening – which is expected to be released this summer. It’ll be the band’s first studio album since 1996’s Heal and will feature former Machine Head drummer Dave McClain, who returned to the Sacred Reich lineup in December. He previously played with the group between 1991 and 1995. Frontman, Phil Rind says: “Recording is in full swing with producer Arthur Rizk at The Platinum Underground in Arizona. In addition to the live dates in the UK and Europe, Sacred Reich will hit the road across North America this spring with Iron Reagan, Leeway and Enforced and also have several festival appearances booked – including an appearance on Megadeth's Megacruise. Find a full list of Sacred Reich’s 2019 tour dates below.